Home Town - Turner Valley, AB. 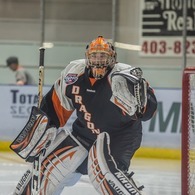 Highly competitive goaltender with quick reflexes and strong positioning. Started at the Junior A level as a first year player and excelled in pressure situations. Tremendous character, commitment, and determination.